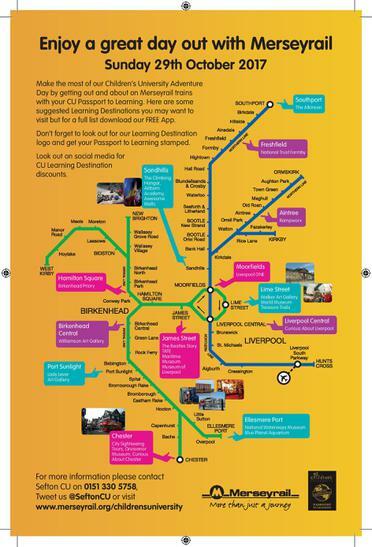 FREE TRAVEL on MERSEYRAIL with Children's University. Sefton Children's University has teamed up with Merseyrail to create 'A Great Day Out' on Sunday October 29th, with FREE tickets available (see below) See all the Learning Destinations on the Merseyrail Network where you can take your Children's University Passport and get a stamp to show you visited. This can help your credits mount up in an enjoyable way. The family can join in too! Download the Merseyrail App for more details.